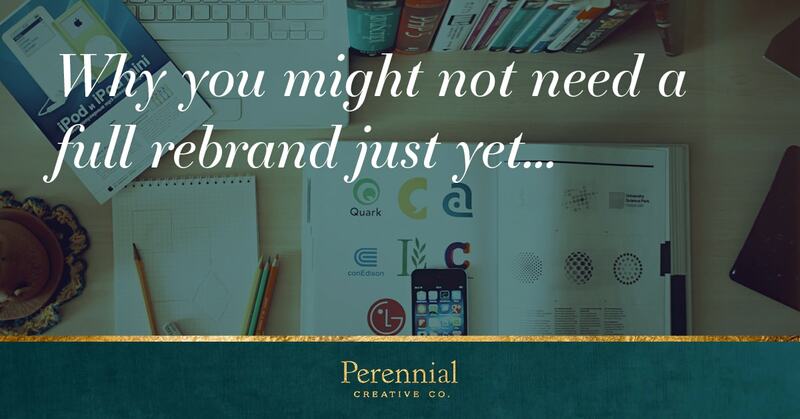 Why you might not need a full rebrand just yet… | Perennial Creative Co.
Like any other designer out there, I love creating a beautiful brand from the ground up. I love picking out each color and each font. I also love selecting the graphic and photographic styles. 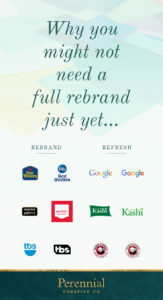 But, a total rebrand isn’t always the answer when your current brand is feeling a little stale. 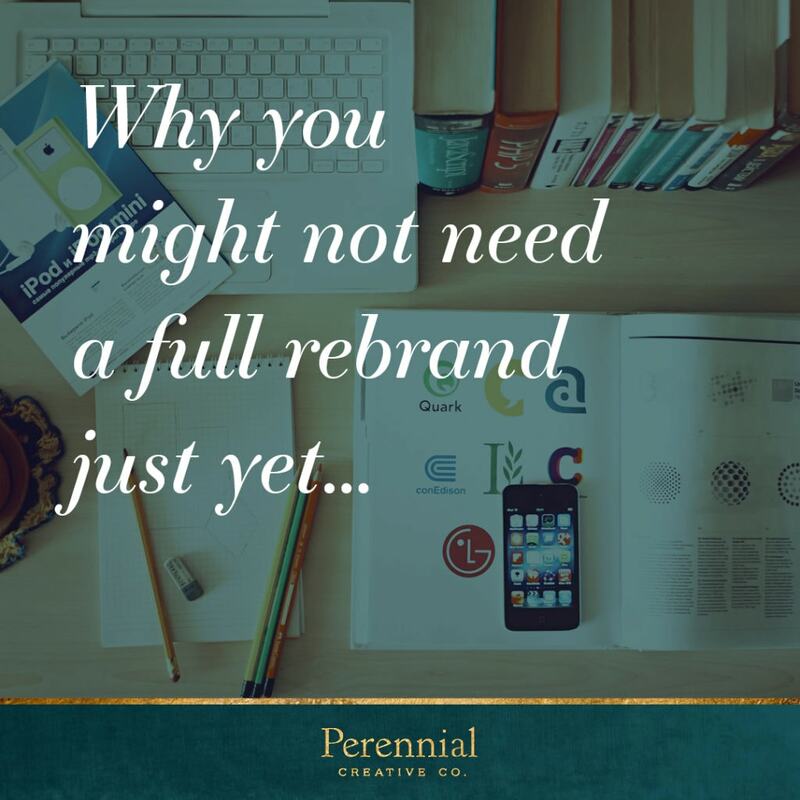 You may not be ready to invest in a total rebrand and, in some cases, a full rebrand can even do you more harm than good. Simone has been working in public relations at a job she likes but doesn’t love for six years after graduating with a communications degree. 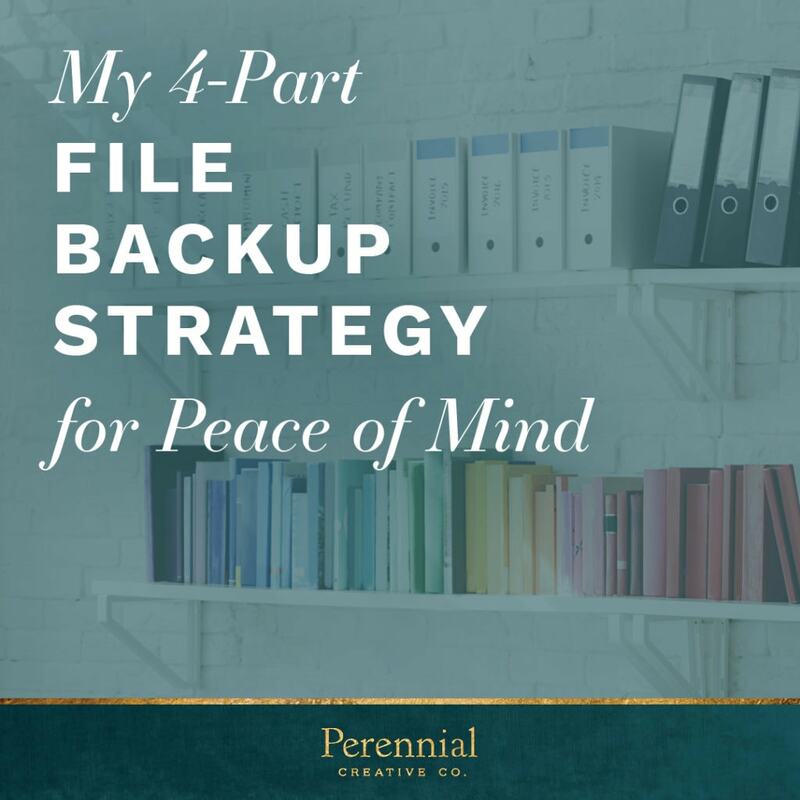 Two years ago, she started offering social media management services to friends and professional contacts on a freelance basis to make more money for a down payment on a house. Simone was a superstar at the PR company she worked for, but the business wasn’t very large, the owners weren’t interested in growing it, and she didn’t see a clear path to advancement. Since she was pretty successful working as a freelancer, she decided to turn it into a legitimate side gig. 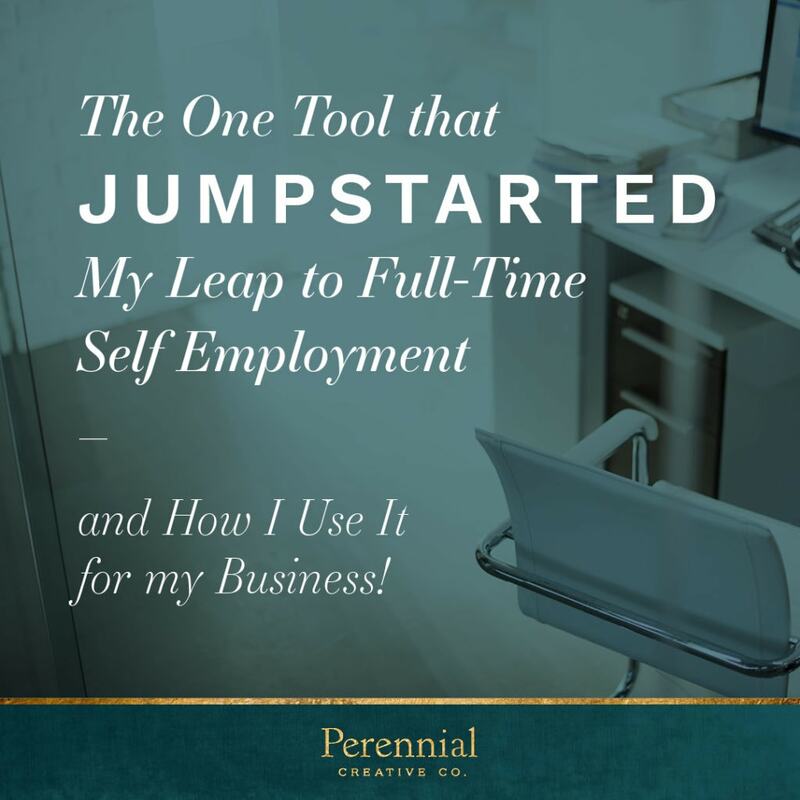 Her goal was to land new clients and gain exposure so she could eventually take her business full-time. She named her business Social Simone and bought an affordable ready-made logo kit off of Etsy. She updated her website template with the colors and fonts from the logo. The Social Simone site is no great beauty, but it’s clean and inoffensive. Fast forward and Simone has been able to run her business full-time for a year now. She’s successful, making a profit, and wants to expand her business. She knows the starter kit logo from Etsy hasn’t got the legs it needs to take Social Simone to the next level, but she still loves the colors and the overall feel of it. She’s already had portraits taken with a color scheme inspired by her current brand. She has over three years worth of Pins, blog post graphics, and other graphics on social media with colors from the original Etsy logo as well. You see, Simone has been building brand equity. She doesn’t want to chuck that all out the window at this early stage in her business. Yet, she still wants something new and fresh that has legs. She’s been dreaming about a custom pattern to brand her proposals and business cards. She also wants to add a tagline to her logo to look more profesh across all the media she creates. Simone needs a brand refresh and not full brand development. A brand refresh is a different kind of animal because it can come in a lot of different colors (and patterns). You love the icon of your logo but not the wordmark. Unlike Simone, you hate your colors and want a color scheme that suits you better. You want a more mature version of your current scheme. Your logo is too basic and you’d like to add some flair. Perhaps, you just have a wordmark and you’d like an icon or a custom illustration. The whole brand is just a little slap dash and needs some refinement. These are all instances where a brand refresh can suffice. Any rebrand should start with an audit of what brand assets you currently have and what needs to be updated. If you’re in the market for a brand refresh: Evaluate what you HAVE and decide what you want to CHANGE or KEEP to define what you NEED. << Tweet This! First, take a look at what logo files you have. Maybe you need a square logo that will work better on social media. Maybe your logo is too square, and you need something horizontal that will work better for your website header. Or maybe you simply need a website favicon. What social media templates do I have? Do I have any patterns or fonts established? Are my colors actually defined (is there a file somewhere that lists their numeric values) or do I just have a vague notion of what the brand colors are? Do I have 10,000 business cards or brochures with certain brand assets I need to continue using? Evaluate your current brand assets so you can define what you need to adjust and what pieces will be affected by that change. This will give you a good idea of what to discuss with a designer including the scope of the project you’d like them to work on. Don’t be afraid to ask a designer what they think of your current brand before hiring them to do the refresh. Does the designer think your design is something they can improve upon? Do they have a good vision of where you all may be able to take the brand? Even the biggest companies do a brand refresh when they know they’ve got something good to work with but still feel like they need a little something new. If your brand is in need of freshening up to be more strategic, more effective, or even just prettier, consider a brand refresh instead of “the full monty”. You might save some dough with small updates to your current site instead of a huge overhaul.